Sitting in 1,000 acres of land Slaley Hall is steeped in ancient English grandeur. The beautiful stately home, situated in the heart of Northumberland exudes class and elegance. The long driveway winds up to the main building and making your way up, you know you're in for something special. Taking advantage of the hotels spa and restaurant was the agenda of the day as our group headed to the notoriously luxurious hotel. Away from the main hotel entrance is the entrance to the spa. The receptionists are friendly and provide crisp white robes, fluffy towels and slippers on arrival, before directing you through to the changing rooms. The spa itself isn't extensive, but the steam room, sauna, Jacuzzi and swimming pool are certainly enough to entertain and relax, and the swimming pool is certain impress. 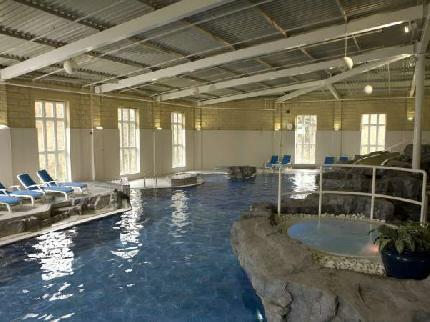 The multi-level pool is surrounded by rocks, has mini waterfalls and even a slide, creating a sort of tropical paradise right in the middle of the Northumberland countryside. A poolside cafe provides reasonably priced bar snacks and juices, and gives the spa a real holiday feel as people chat and relax. After indulging by the pool, head for a treatment, as they're set to leave you floating on air. Choosing to have a full body massage, the therapist worked magic to the sound of soothing music as she expertly unknotted and loosened every muscle. Finished working wonders, the therapist will lead you back to the spa for even more pampering time. After swooning over how fantastic we felt, it was time to head up to Hadrian's Brasserie for a well earned feed. The restaurant combines old style glamour and modern day dining. Dark wood walls, heavy fabrics and leather create an intimate setting, and the food is simply divine. The monk fish and squid starter was cooked to perfection. The monk fish melted in the mouth and there was nothing rubbery about the succulent squid. Main course is no different to the starters, local produce cooked to perfection, lots of flavour, and very reasonable portions- something that was not expected. The sundried tomato foccacia with garlic mushrooms and butternut squash is a firm recommendation. The lamb shank with cous cous was also praised as the lamb fell off the bone. Deserts comprise light nougatine parfait, a scrumptious key lime pie and a chocolate Chambord cheesecake. All inducing 'mmmm's' and a swapping of plates as everyone wanted to try the others desert. The meal is the icing on the cake, as the excellent quality food and lavish surroundings, combined with the wait staff's high quality service create a special experience. All in all a wonderful day: Opulence to leave you feeling truly spoiled, and sure to keep you coming back. Spa package prices vary, and 2 course meals in Hadrians Brasserie start from around £22.